In Brief: Camp overnight in or beside a Great Wall tower on a stretch of wild wall. You’ll hike easier with just the essentials in your day pack; we’ll arrange delivery of the camping equipment to the campsite. Sunset over the Great Wall Spur. 2–4 hours of hiking each day. UPDATE: Had to cancel this one, sorry. 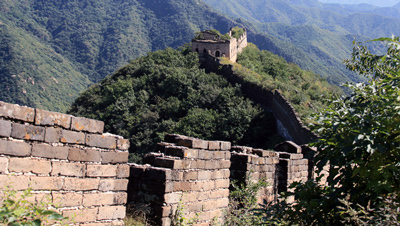 On this two day Great Wall adventure you'll hike the Great Wall and camp in or beside a Great Wall tower. We’ll take care of the heavy lifting and have the camping equipment delivered direct to our campsite; you’ll be free to enjoy the scenery, sunset, stars, and sunrise without all the sweat involved in a full-on camping expedition. We’ll supply the camping equipment, water, snacks, and breakfast and a restaurant lunch on the second day. Discounted price available if you have your own camping gear. Maximum group size of 14 hikers; book early to make sure you get a spot! We'll have a fairly good idea of the weather by about three days before the hike. If it's forecast to be dangerous or no fun – i.e. thunder and lightning, or heavy rain – we'd need to change the camping location,postpone it to the next weekend, or call it off altogether. Our base camp will be on the wall near a solid tower near the end of a line of unrestored Great Wall, up on a ridge. If you would prefer to camp on the grass, there’s a little space below the tower – it might be a bit overgrown, though! To the south there are views of a broad valley and far off hills, with little bits of Beijing’s urban sprawl there to see if it’s a clear day. In the other directions you’ll see mountainous terrain, some of which has a line of Great Wall running along high ridges. We’ll have broad views to the west, north, and east, and you’ll be able to see the sun rise over part of the Jiankou Great Wall at about by poking your head out of your tent at around about 5:36am. Fire restrictions mean that we won’t be able to have a campfire here. The sun will set just after 6:50pm, and we’ll be able to watch as the sun slowly sinks below a tall ridge of mountains. Moon phase: Just before Third Quarter. The sun will rise in the hills behind our campsite at around about 5:36am. Snacks: We’ll supply another Snickers bars, an apple, and nuts and things to make trail mix. We supply: one tent for each person, sleeping bag and liner, ground pad, hiking poles. Do you have your own camping gear? Let us know, and we’ll adjust the price for you. We'll have the camping equipment and food delivered to the campsite for you. Pack anything else you'll need into your day pack. If you'd like, you can leave a change of clothes on the bus. This one is short, but steep! The hike begins with a short walk up a valley road, followed by a climb up a hillside path to reach the Great Wall. This steep climb will take about forty minutes, and is the most difficult part of the hike. After reaching the top we’ll follow the Great Wall as it winds along and up a ridge. The Great Wall was designed as a defensive fortification, so we will get excellent views, with mountains, villages, and other stretches of the Great Wall all in sight as we walk. We will pass through towers along the way, and stop for a snack break at the highest point. Our walk on the Wall will finish at a big tower – and this is where we'll be camping! On the second day of the trip, we’ll pack up the tents, fill up with some water, and hike back up to the high point we were at the previous day. From there we’ll follow a different stretch of wall down into a valley, where we'll find a concrete road. We’ll follow the concrete road further up into the hills. After about thirty minutes we’ll be at the end of the road, and on to a hill trail that takes us up to the Great Wall again. Today’s walk has an easy option, and a tougher option. On the easy option you won’t follow the wall, instead heading down into a valley, and then up and over a ridge to finish at a small village. We recommend you take the tougher option! You’ll follow a rough line of Great Wall, using hill trails to skirt around a few impassable sections. On a clear day, the views from this line of Great Wall are really good: the Chinese Knot, 'Upside Down Flying Eagle', and Heavenly Stairs (all Jiankou landmarks) in front of us, the Nine-Eyes Tower behind us, and the eastern side of Jiankou off to our left. Sometimes you can see all the way to Mutianyu, a restored section of wall. The hill trails we follow for this part of the hike are a little tricky⁠—⁠sometimes steep, sometimes narrow, sometimes both! Just before we get to the really steep section below the Chinese Knot, we’ll finish our hike along the wall, following a hill trail through a forest down to the small village below. 15 photos from a camping trip at the Great Wall Spur. 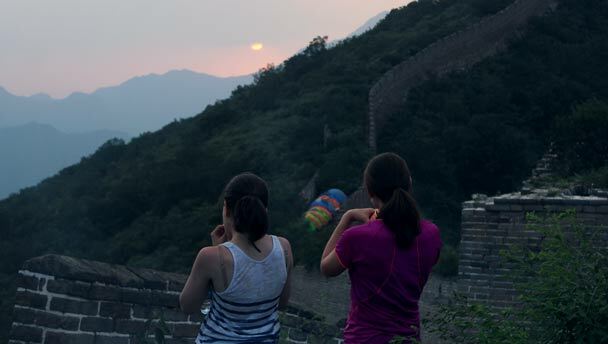 See 21 photos from an overnighter on the Great Wall. See shots of sunset and sunrise on the Great Wall Spur, a stretch of wild Great Wall in Huairou District. Photos from a camping trip arranged by request for a group of friends. Photos from a camping trip at the Great Wall Spur. Photos from our camping trip to the Great Wall Spur.